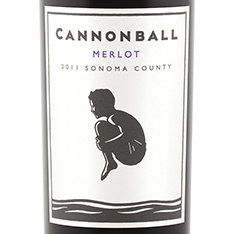 I last tasted the Cab Sauv as well as the Sauv Blanc from Cannonball so I was anxious to try the Merlot from them that was on the most recent release. I like the label it’s cute. As usual personal bias up front, I like my Merlot’s fruity, smooth and what I consider varietal. Dark in color with a nose of rich red berries. On the mid pallet the wine matches the nose with lovely rich red berries coming through. Far more reminiscent to their cab IMHO than what I expect from a Merlot. On the medium length finish the wine displays some firm tannins along with some acidity. This is a lovely wine, albeit in my mind more cab than Merlot. With that aside I would give it a solid 89. It should have some good life in it too. I would be surprised for it to continue to show well/improve over the next 2-5 years. Yumm. Especially given the price!